Right from his pre-teens, Justin has been having one rollicking adventure after another in all avenues of entertainment, whether it is television, music or cinema. Having being part of NSYNC, one of the biggest boy bands ever, Timberlake later went on to establish himself as an A-list solo music act. He has sold tens of millions of records, collaborated and associated with some of the biggest names in entertainment and been the subject of various controversies. After his performance at the Super Bowl Half Time show in February, the pop heartthrob will kick off a series of concerts in March. To enjoy his hits in a live atmosphere, all you need to do is book Justin Timberlake tickets in advance. Tickets for Justin Timberlake are currently unavailable. Justin Timberlake embodies a melting-pot of transatlantic elements, what with his English and Native American roots. Though growing up in a broken home following his parents’ divorce whilst he was only four, Justin soon displayed his performing whiskers by landing a spot on the famed television show The Mickey Mouse Club before he had even broken through his teens. Sharing the spotlight with other prominent musicians and actors in the making such as Christina Aguilera, Britney Spears, Ryan Gosling and future band-mate JC Chasez, Justin soon teamed up with Chasez as well as Chris Kirkpatrick, Joey Fatone and Lance Bass to form ‘N Sync in 1995, following the television show’s demise the year before. Throughout the years, the accolades for Justin Timberlake’s work have kept on coming. Justin’s lead vocals, boy charms and slick dance moves developed the perfect chemistry with his ‘N Sync bandmates, landing the joint act some two dozen awards in the late nineties and the early 2000s, across entities such as Billboard, American Music Awards, MTV VMAs, Teen and People’s choice Awards. Their debut album *NSYNC went 10 times Platinum with the following No Strings Attached and Celebrity going 11 and 5 times respectively, spawning hit singles such as "Bye Bye Bye" and "It's Gonna Be Me". Though having only come out with two studio albums, 2002’s Justified and 2006’s FutureSex/LoveSounds, Justin matched his ‘N Sync critical credentials with another two dozen of his own, including an impressive 6 Grammys, 7 VMAs and 3 each for the Brit and American Music Awards. His singles, such as "SexyBack" ft. Timbaland, "My Love" ft. T.I. and "What Goes Around... Comes Around", have enjoyed frequent flings with the charts. Justin Timberlake seems to have the Midas touch when it comes to musical performances and collaborations. Whether contributing vocals to the Black Eyed Peas "Where is the Love?" or going down in popular culture as the originator of the "Wardrobe Malfunction" whilst performing during the Super Bowl XXXVIII’s halftime-show with Janet Jackson; doing the Justified/Stripped Tour with former fellow Mousketeer Christina Aguilera, serenading some Victoria’s Secret hotties on their home turf or teaming up with the Maestro Timbaland both in the studio and on stage. Justin’s songwriting and music production prowess has seen him work with the likes of Chris Cornell and Duran Duran to Rihanna, 50 Cent and Madonna, also featuring on the latter two’s tracks "Ayo Technology" and "4 minutes" respectively. The teen/twenty-something music world has been bombarded with a lot of different sounds over the years, courtesy the likes of Donny Osmond and Jackson Five in the 70s, Michael Jackson, Madonna and New Kids on the Block in the eighties and then ‘N Sync, Backstreet Boys, Britney Spears and Christina Aguilera in the nineties and beyond. In fact, it was the New Kids that paved the road around the block for ‘N Sync and Backstreet Boys, both of which were created by the infamous Lou Pearlman. The real life Captain Hook for Justin, Pearlman not only defrauded his boy band progenies but dozens of others out of hundreds of millions of dollars in elaborate Ponzi schemes. Nonetheless, Justin Timberlake has prevailed through the subterfuge and a solo career by keeping "in sync" with the changing faces of musical genres, whether its bubblegum-pop, urban-dance, hip-hop, RnB or techno. Being bestowed with titles such as the "Sexiest Man" and "Most Stylish Man in America" by Cosmopolitan and GQ respectively, Justin Timberlake has kept his finger on the quickening pulse of the contemporary zeitgeist. So for getting your own musical resuscitation from this cocky Caucasian, get your Justin Timberlake tickets now! In early 2018, Justin Timberlake dropped his much anticipated studio effort, ‘Man of the Woods.’ The album followed his previously released double albums, ‘The 20/20 Experience’ and ‘The 20/20 Experience – 2 of 2’ and peaked at the first spot on the Billboard 200. The album recorded gold level sales in the States by selling more than five hundred thousand units and received a 55/100 rating from Metacritic. Justin Timberlake kicked off his, ‘Man of the Woods Tour’ to support this record on March 13, 2018. He has played several shows in cities like, Toronto, Detroit and Boston. The fun is far from over as Justin Timberlake Announces Next Leg Of Tour (MAN OF THE WOODS TOUR). This leg is scheduled to begin on January 4, 2019 with a show at the Capital One Arena in Washington. He plans to end the trek by playing his last gig in Denver. Justin Timberlake fans are in for a treat as the artist finally announced his Man of the Woods Tour to Europe where he will perform new songs from his new album. The album Man of the Woods was released in 2018 and he is expected to perform to tracks such as “Man of the Woods,” “Filthy” and “Say Something.” The tour starts from Tuesday, July 3, 2018, as Timberlake starts his performances from the AccorHotels Arena in Paris and will further perform in Glasgow, London, Mannheim, Amsterdam, Merksem and Koln. This tour is going to see Justin Timberlake perform in multiple cities. Do not wait. The best prices are here so get Justin Timberlake Man of the Woods tour tickets now. Justin Timberlake has dropped his new single, Say Something from his upcoming album, ‘Man of the Woods.’ The song features the five-time Grammy winner, Chris Stapleton and has been praised by many famous publications including, Taste of Country, The Washington Post and Billboard. Justin Timberlake’s fifth studio record, ‘Man of the Woods’ is scheduled to hit the shelves on February 2, 2018. He will also be going on tour in support of it and will be starting the trek in March by performing two consecutive shows at the Air Canada Centre in Toronto. Justin Timberlake has recently announced the dates for his upcoming North American tour. It is in support of his music record Man of the Woods. The trek includes 25 dates and the first show will be held in Toronto on March 13. The Grammy winning singer will then visit cities such as Washington DC, Los Angeles, Las Vegas, Atlanta, Dallas and Miami. Before getting started with the tour, Justin will be seen at the much anticipated Super Bowl LII Halftime Show. Justin Timberlake’s latest studio album Man of the Woods is slated to release in February, 2018. He is back! The ten-time Grammy winner who has released popular songs like, Mirrors and Not A Bad Thing, Justin Timberlake is going to drop his fifth studio album, ‘Man of the Woods’ on February 2, 2018. He also released the trailer of his upcoming studio project, on January 2, 2018 which has been viewed more than four hundred thousand times on YouTube so far. In addition, Justin Timberlake has announced that he will be dropping the album’s first single on January 5, 2018. Famous American singer and songwriter Justin Timberlake is all set to treat his fans to a new music album this coming February. The record will be a follow-up to his 2013 album The 20/20 Experience 2 &2. The singer will also be the headline act for the much anticipated half time show of the Super Bowl. The event will also serve as the official launch of the new record. Justin recently appeared as a guest vocalist on the song Make It Right which features on Foo Fighters’ music album Concrete and Gold. Justin Timberlake is going to perform at the Super Bowl haltime Show? Is Justin Timberlake going to perform at the Super Bowl 52 halftime show? The answer to the question is yes if the reports are to be believed. This will be the first time in fourteen years that he will perform at the biggest game in North American sports. The last time he stepped on the stage for the Super Bowl halftime show was at Super Bowl XXXVIII. According to the reports coming from US Weekly, Timberlake will be headlining the event on his own. Super Bowl 52 is all set to take place on February 4, 2018 at the U.S. Bank Stadium. Currently the average price for Justin Timberlake tickets is $292. The date and location for this event is 13-Apr-19 at Mohegan Sun Arena - CT, Uncasville. The minimum get-in price for Justin Timberlake tickets is $138. Q:How can I pay for my Justin Timberlake tickets? A:The Justin Timberlake tickets that you see on our website can only be bought via credit card. This is because our certified brokers, who are the ones selling these tickets only prefer that payment method. Please remember that payments made through cash will not be accepted. Q:Can you please tell me when will Justin Timberlake perform in Orlando? A:Sure! The Memphis Music Hall of Famer, Justin Timberlake has announced a show in Orlando for May 14, 2018. The concert will take place live at the Amway Center. If you wish to attend it, the good news is that our brokers are currently selling Justin Timberlake tickets on our website. So, buy them today if you want to enjoy his thrilling live performance. Q:How much are Justin Timberlake tickets for his show in Orlando? A:Our certified brokers have Justin Timberlake tickets in stock for his show in Orlando and they are currently selling them on our website at an average price of $540. So, if you want to catch this multi-time Grammy winner live then purchase your concert tickets from our brokers now. Q:From where can I buy Justin Timberlake tickets? A:If you want to purchase your Justin Timberlake securely and without any hassle then we would recommend you to buy them from our website. We have taken necessary security measures to make our website free from scammers so that you can enjoy doing business with us. Moreover, our trusted brokers always offer best deals on tickets. This is because they want everyone to enjoy their favorite events. So, visit the event's page to get tickets to Justin Timberlake's show and enjoy his concert live. Q:How much do Justin Timberlake tickets cost for his concert in Duluth? A:The R&B icon, Justin Timberlake will be supporting his latest album, 'Man of the Woods' by performing a show in Duluth on May 11, 2018. If you are a fan of his music then this is the best chance to see him live. So, purchase your Justin Timberlake tickets for the concert from our trusted brokers. Their average price as of now is $645. Q:Can I bring my video camera to a Justin Timberlake concert? A:We cannot say anything regarding this subject matter as each venue has its own policy of permissible and prohibited items. As we are not linked with any venue, we are unable to offer you any information about such policies. However, we will recommend you to visit the official website of the venue as it will help you find out if you can take your video camera to a Justin Timberlake concert or not. Q:Will Justin Timberlake play his latest hits from the album, Man of the Woods live? A:Yes! Justin Timberlake will be performing his latest songs from his most recent studio record, 'Man of the Woods.' These include songs such as Say Something, Filthy and Supplies. Plus, he would be performing his greatest hits as well. Q:How much will Justin Timberlake tickets cost for his event in Nashville? A:The Music City will soon be rocked by Justin Timberlake as he will be bringing his tour to Nashville this summer. So, if you are in town then why don't you watch his entertaining performance live by buying your Justin Timberlake tickets from our website. As of now, the tickets for that concert are being sold by our reliable brokers at an average price of $554. Q:How much are Justin Timberlake tickets for his concert at the Little Caesars Arena? A:The R&B icon, Justin Timberlake is all set to make his presence felt at the Little Caesars Arena in Detorit on April 2, 2018. If you want to become a part of his highly entertaining show live then all you need are your Justin Timberlake tickets. You can get them today from our reliable brokers as they are selling them at an average price of $178. Q:How much are Justin Timberlake tickets for his show in Salt Lake City? A:The bona fide hit maker, Justin Timberlake will be seen supporting his latest album, 'Man of the Woods' in a show at the Vivint Smart Home Arena in Salt Lake City. 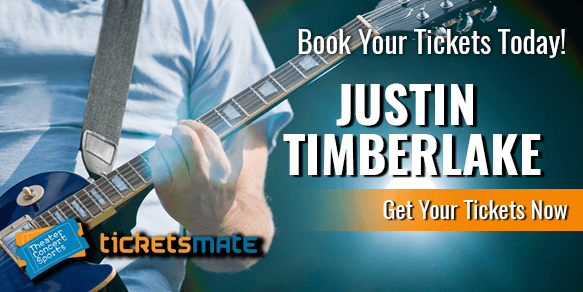 If you want to attend that concert then head over to the event section of our website and buy Justin Timberlake tickets which are currently being sold by our reliable brokers at an average price of $435. Q:What is the best place to buy Cheap Justin Timberlake Concert Tickets? A:You can easily get Justin Timberlake Tickets at our website. Simply visit the relevant event page on our website and browse the prices of available tickets. As you will notice, ticket prices vary over a large range, so simply select the ones which most suit your budget requirements. You can also avail our various discount packages and special offers to get the best possible price for your tickets. Q:When do Justin Timberlake Tickets go on sale? A:Justin Timberlake Tickets are currently being sold at our website. Simply go the relevant event page on our website and you will find the list of available tickets. Select the ones that most suit your budget range and purchase them by following just a few simple steps. Q:Am I in time to get discounted tickets to Justin Timberlake Concerts? A:Sure, the Tickets are now available on our website at discounted rates so order right away. Q:How do I information about Justin Timberlake Tour Dates? A:You can get information about the tour and its Tickets by paying our website a visit. You can also call us on our toll free number if you need any further help. Q:Are you still selling any Justin Timberlake Concert Tour tickets? A:There are still a few Tickets left with us so order right off before they run out. Q:When is the last day to buy justin timberlake concert tickets? A:You can buy Justin Timberlake Tickets at any time you want before the event and there is no deadline as such. Q:I have lost my justin timberlake concert tickets, can I get a refund? A:We are sorry but if you have lost your Justin Timberlake Tickets you cannot get a refund as we do not offer such facilities and that is also mentioned on our terms and conditions web page. Q:Can I buy justin timberlake tickets for my children? A:Please contact the venue before ordering Justin Timberlake Tickets for your kids. Q:Where can I get cheap justin timberlake tickets from? A:Visit our website for Justin Timberlake Tickets at low rates and get your tickets now.